Provide a new roadway and multi-use path to improve east-west mobility, support economic vitality, protect roadway safety on local residential streets, and encourage alternative modes of transportation. The Mall Road Connector Phase 2 project will complete the connection for vehicles, pedestrians and bicycles from the residential development in the Burlington and Florence area to the Mall Road area, that will serve as a collector route. East-west mobility through central Boone County will be improved by providing a new route. The new route is expected to reduce the traffic demand on US 42 and KY 18 (Burlington Pike). This recommendation is consistent with Boone County’s overall goal of improved bicycle and pedestrian connectivity and safety. Click HERE for a map of multi-use paths in Boone County. The project will need to be coordinated with future planned development through the Boone County Planning Commission. Currently, the only direct connection for vehicles and pedestrians in the project area to the Mall Road district is through KY 18 (Burlington Pike) or US 42. 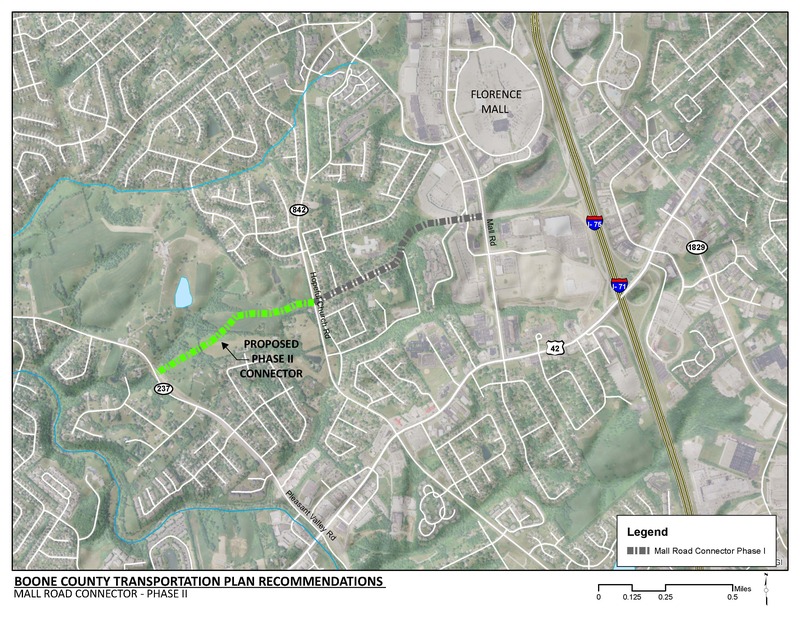 Select areas closer to KY 18 (Burlington Pike) also have an option to use a disjointed connection through residential streets along the northern side of the development. As delay on KY 18 (Burlington Pike) and US 42 increases from additional traffic, travelers may choose to use residential streets, not designed for through traffic, as alternative routes. The proposed roadway will serve existing residential development in the Burlington and Florence areas. This project will be constructed on properties currently serving as agricultural and woodland land uses. However, the 2040 land use map shows these areas as suburban density residential.